Split your meal ticket quickly and easily. Getting the bill doesn't have to be a hassle when enjoying a meal with a group of friends or associates. 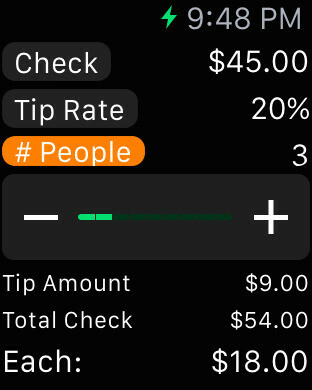 Using your Apple Watch you can calculate each person's share without fiddling around for your phone. Quick an easy - just confirm the total meal cost and the number of people. SplitTheCheck will instantly show the cost for each person. Have a deadbeat or freeloader in your party? Just re-adjust the slider to distribute their unfair share to everyone else. Designed to be fast and easy! 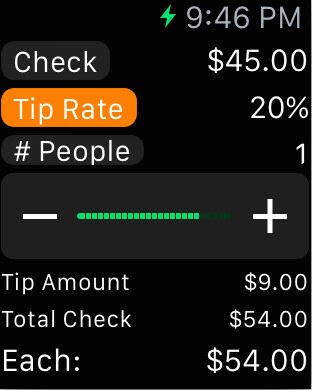 With your Apple Watch you can even secretly use the app without embarrassing everyone by bringing out your phone, scribbling on a piece of paper, or using one of those ancient little electronic calculators. 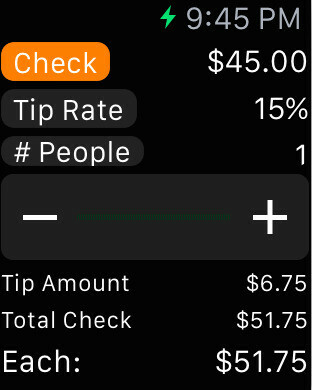 Hand crafted to provide the only tip calculator with an all-in-one display. No scrolling around to input data, no confusing multiple screens, no "mystery clicks" with unpredictable results. Clean, straightforward, utilitarian user interface. Just calculate the tip, split the check, and finish your dessert! Have ideas or suggestions for improvements? Want to beta test new versions? Click on our support url link and let us know! Everything is on a single quick-to-use screen. Simply tap on the desired field (Check, Tip Rate, or # People) and use the sliders to make your selection. The results are displayed instantly without any additional touch or keypress input.